Cutting your own bouquets from the garden is one of the joys of growing flowers. When you have a flower garden, you can afford to cut armloads from the garden to fill your vases. Don’t worry about taking away from the beauty of your outdoor display. When you cut flowering stems from annuals and repeat-blooming perennials, you are actually encouraging more flower buds to form. If you are reluctant to cut your own flowers, consider setting aside a garden bed to grow flowers purely for cutting. Make sure that your cutting tools (pruners are best) and vases are clean. Cut flowers when it’s cool outside; the early morning is ideal because flowers and stems are filled with water and at their freshest. Evenings are another alternative. To keep flowers fresh, take a bucket of water with you to hold flower stems as you cut. Cut stems at a 45-degree angle to create bigger area for water absorption. Flowers with more than one bud per stem such as gladiolas, snapdragons or phlox should have at least one or two buds starting to open before you cut them. Plants with one flower per stem such as sunflowers, asters and gerbera daisies should be cut when the flower has opened. 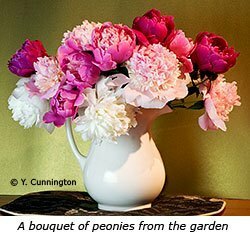 For longer-lasting bouquets from the garden, condition your flowers first. This means picking them a day before you need the arrangement and keeping them in a clean bucket of cool water in a cool, dark place for 12 to 24 hours. When you put your arrangement together, recut stems at a 45-degree angle, and remove any leaves below the water line. This decreases the potential for bacteria to thrive and hasten stem and flower spoilage. To the clean water in your vase, add floral preservative, which you can buy from florists. It contains nutrients and fungicide to extend vase life. To keep your bouquets fresher longer, top up water daily, and keep cut flowers away from direct sun. Daffodils (Narcissus species) cause other flowers to spoil if they are added to an arrangement, so use these flowers in vases by themselves.